Barking is a dog behavior that owners can find frustrating. Dogs bark for several reasons and their body language and barks differ for each situation. Dog breeds that are protective of your home and property will bark when a stranger approaches. They will also bark to alert you if anything unusual occurs, such as a loud noise or a vehicle going by. Dogs who bark to guard territory tend to have an upright and forward body posture, and their body language will coincide with saying, "Go away! Private property!" The sound of this type of barking is low-pitched and sharp without much change. The barking will dissipate once the "threat" subsides. Dogs that are excited will bark in a rapid, high frequency tone that can escalate in speed and volume as the dog's excitement increases. This type of barking can occur when a dog is greeting a family member or a stranger they are happy to meet, or during a play session. The body language that goes with excitement barking is bouncy, energetic and often full of vertical movement, such as the dog jumping up to greet people or to play. Dogs that are under-stimulated can bark to give themselves something to do. If neglected, this barking can become a compulsive behavior. This type of barking often has a monotonous pattern to it and may increase or decrease in volume and speed somewhat, but mostly it doesn't change. If the dog is barking because of loneliness in addition to boredom, the barking may include howling and longer gaps in the sequences of barking. Dogs that are anxious will bark to cope with their stress. 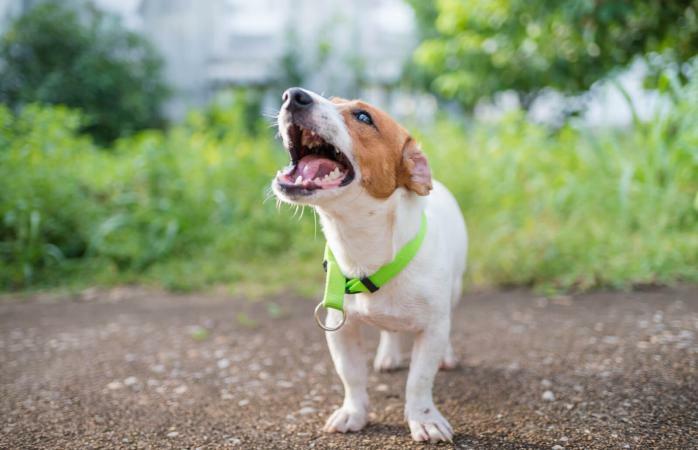 This type of high-pitched barking can increase and decrease in volume and speed in cycles, and the intensity can continue to increase if nothing is done to decrease the dog's stress. Dogs with severe anxiety, such as separation anxiety, will have very intense cycles, and they may include other vocalizations such as howling, moaning and wailing. Their body language may include a lot of nervous movements such as pacing, sweaty paws, drooling and circling. Dogs that are fearful will bark rapidly. This is accompanied by nervous, defensive body language, such as their body getting lower to the ground, backing up while barking, putting their ears back and possibly tucking their tail under their body. It may also include rapid eye movements as if the dog is continuously determining the proximity of the threat and possible escape routes. If the dog feels truly fearful and cornered, it may include growling, air snaps and even biting. Some dogs will bark to get you to pay attention to them or give them something they want. This type of barking is often a series of short, sharp barks with the dog fixated on the person. The barks may escalate in volume and intensity if the dog does not receive attention, also known as an extinction burst. Some dogs will bark if they are suffering from a medical issue. This could be because they are in pain or want your attention to deal with their discomfort. Older dogs suffering from canine dementia can bark in a repetitive, monotonous pattern. Going blind or deaf can also cause a dog to bark due to their anxiety over the loss of their senses and a sense of confusion. Dogs bark at night mostly for all the reasons already presented. They bark to alert their humans of possible threats and if you live in the country or a semi-rural area, more wildlife will be out at night which leads to more barking. Dogs will also bark in response to other dogs barking at night. Another reason dogs bark during the night can be separation distress if they cannot get to you, such as dogs that are crated at night or locked out of the bedroom or in the yard. Young puppies will also bark at night when crated as they are anxious and haven't yet learned to settle in and sleep. There are several methods and strategies to stop this type of barking. Do Dogs Bark for No Reason? While it can seem like your dog is barking for no reason at all, this is very unlikely. If your dog is barking, something is happening to cause it. It can be something in the environment or something internal such as fear or stress. Dogs' sense of smell and hearing are many times greater than a human's, and they can detect noises and odors that are beyond a human's capability. Just because it seems like "nothing" is going on to you, that doesn't mean your dog doesn't have a reason for his behavior. It is far easier to stop the barking if you know why the dog is barking in the first place. Dogs use vocalization to communicate with you and with other dogs. If you pay attention to your dog's environment, daily routine, health and the tone and frequency of their barks coupled with body language, you can determine the reasoning behind their barking and modify the behavior.